This morning was bright and clear so a plan was hatched to go and visit some of the local sites that we tend not to get to that often. 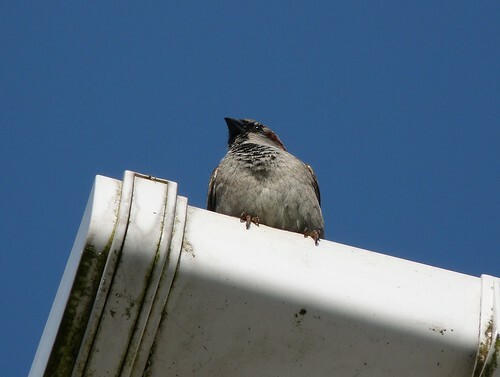 First things first we had to negotiate the garden and a very vocal male House Sparrow which appears to have taken up residence on the corner of our house. 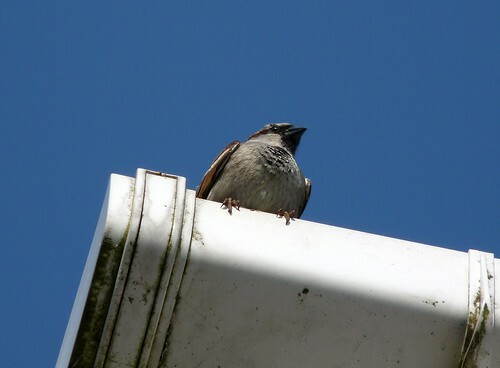 He has spent the last couple of days sitting on the guttering and has called loudly for the majority of that time. I am pretty sure that he hasn't got a nest up there as the tiles are too well sealed so it is possibly just a territorial display. Either way he certainly has good volume and can be heard throughout the house. First port of call was Mumbles on Gower. We arrived relatively early (well 10am is pretty early for a Sunday) in the hope that we would avoid the last of the Easter holiday makers. 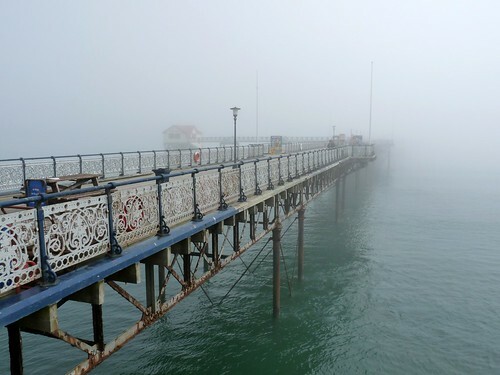 We did manage that but hadn't banked on the sea fog that was enveloping Swansea Bay like a duvet. 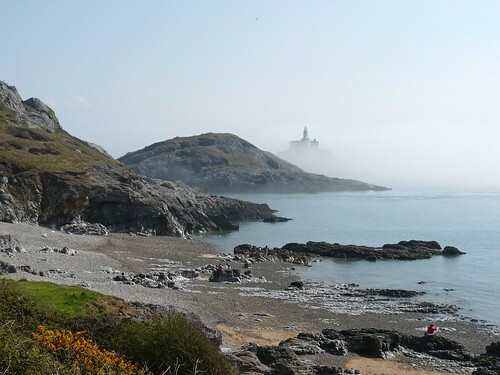 Mumbles Pier was almost lost to view as was the lighthouse. The only sign of its existence was the sound of the fog horn warning local shipping of the treacherous rocks ahead. 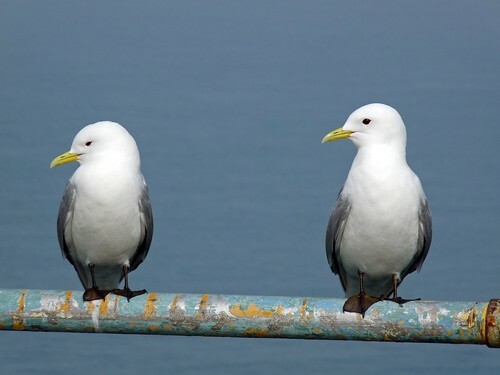 The reason for our visit to Mumbles was to check out the Kittiwakes which have recently arrived back in the country at their breeding site at the end of Mumbles Pier. We were in luck with approximately forty individuals clinging to the various ledges and fences. There were signs of the first attempts at nest building but nothing substantial was in place and any egg laying looked a fair way off. 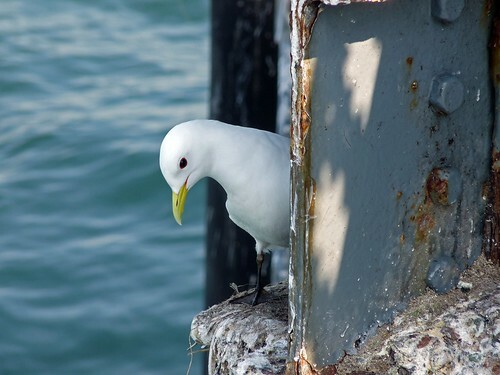 Unfortunately the Kittiwakes have to share their home with the local fishermen which does have its hazards. Whilst we were there one unlucky individual got itself caught in a line. Fortunately the person whose rod it was pulled the bird in and set it free. I just hope that the rest are as lucky as the season progresses. 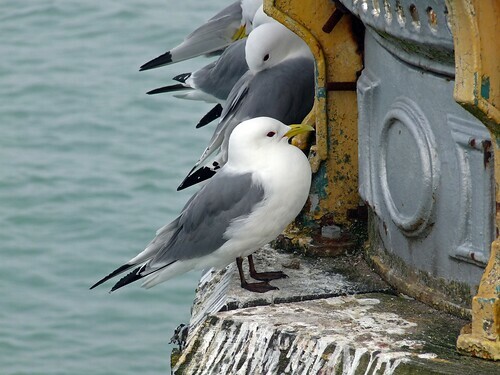 Apart from the Kittiwakes the launch ramp from the lifeboat station held twenty or so Turnstones. 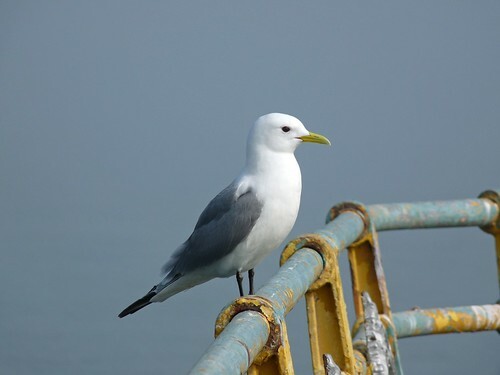 More unusual was the fact that nearby Bracelet Bay didn't have a single Mediterranean Gull on offer. This is usually a sure fire location to find this species. Maybe they have moved around the coast a bit to find a quieter area until the tourists go home again. Next stop after Mumbles was Burry Port on the other side of the Burry Inlet. 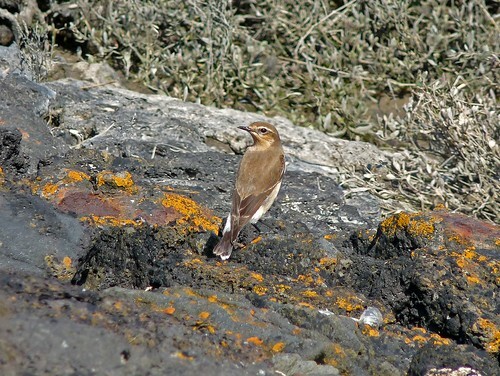 A couple of Linnets greeted our arrival but the real gems were to be found just around the corner. 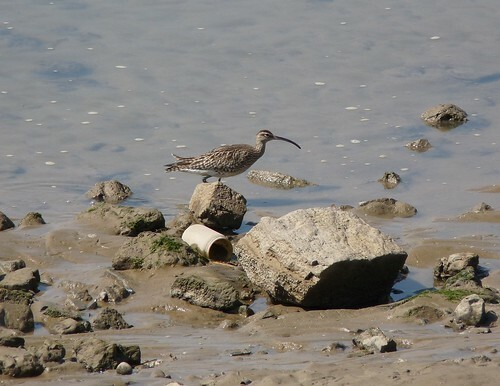 A family pointed out a Curlew feeding in close to the harbor wall which was nice. 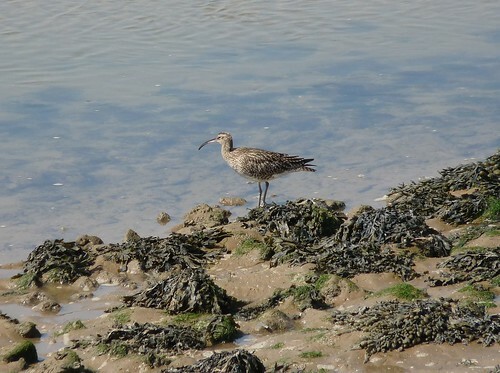 What was even nicer was the realisation that it was in fact a Whimbrel, and that it had a companion! These are the first Whimbrel's of the year for me and certainly the first photographs that I have ever managed to get of this species. On the other side of the harbor wall a male White Wagtail was trying and succeeding to make it as difficult as possible for me to get a photograph of it. 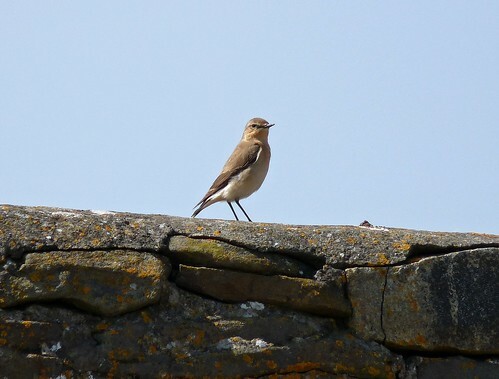 Never mind as a moment later a female Wheatear popped onto the wall and posed for a while before flying on. Whilst at Burry Port we also saw a couple of Swallows, as well as several Ringed Plovers and a couple of summer plumaged Dunlin. The day was finished off with another very nice sunset, pictures of which will follow in the next post. All in all a classic day on this wonderful coast.